Danielle Cormack. Photo: Brett Boardman. At their best the rhymes come fizzing and spitting at you, the wit sizzling as writer Justin Fleming throws fat on Moliere’s fire. At other times the work feels more laboured, as if Moliere’s satire and Fleming’s meter, rhymes and token modernity have been scrunched together like so many peak-hour commuters on a Sydney train. Fleming has explained how and why he has varied his rhyme schemes’ architecture in previously adapting Moliere, and this ingenuity lubricates the wit as much the many clever rhymes, themselves. Such flashes of virtuosity on Fleming’s part let us glimpse how Moliere dazzled his audiences 350 years ago, and, for those fluent in French, continues to do so. Oddly enough, however, this particular play, widely considered his finest, was a flop in Paris in 1666, primarily because the central character, Alceste, the title’s misanthrope, is not intrinsically comical. Even today, he – or in this joint Bell Shakespeare/Griffin Theatre production, she – tests the audience almost as much as she does the other characters with her relentless fault-finding of the rest of humanity. Her saving grace – beyond her unfaltering honour and probity – is her ability to detect her own faults, also. Director Lee Lewis suggested Fleming swap Alceste’s gender, and it has been made to work. 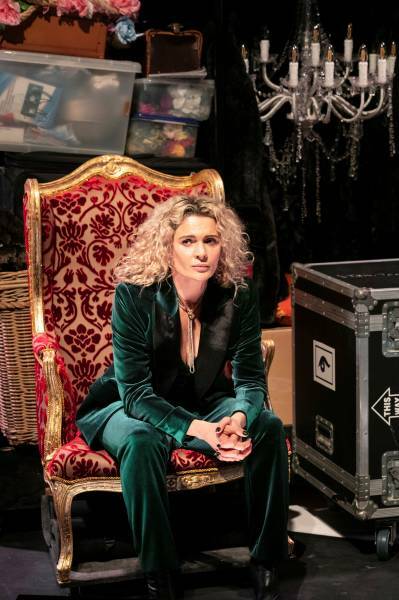 Nonetheless, because the character is more admirable than likable, the actor must bring some compensatory charisma, and Danielle Cormack does show sparks of this, particularly early on. But as the play develops and Alceste becomes more frustrated, Cormack loses this ability to compensate us with charm. Despite finding humanity so deeply flawed, Alceste’s anger should be tempered with a quality akin to despairing of its foibles. Although Cormack is capable of exuding a certain energy and effervescence, somewhere between her performance, Lewis’s direction and Fleming’s writing, a disproportionate stridency sneaks in. Ben Gerrard and Danielle Cormack. Photo: Brett Boardman. That gender-swap necessitated others, including Celimene, Alceste’s love-interest, becoming Cymbeline (Ben Gerrard), in what is the production’s most entertaining creation. Cymbeline is a pop star of such preening narcissism (if that is not tautological) that one wonders what Alceste could possibly see in him, given that you’d expect her to lose her heart to more than pretty-boy looks and modest talent. He also has such rare capacity for believing his own lies that a future in politics may beckon if his stardom proves fleeting. Cymbeline is a flirtatious (like Celimene) and promiscuous 20-year-old, his aversion to commitment outweighing the genuine attraction he feels for Alceste, not just physically, but as a potentially beneficent force in his life – although her vision of a shared, secluded monogamy is his vision of hell. Alas all the performances (and directing) are strained and seem to strain against the text. Rebecca Massey is Philippa, Alceste’s friend, an irritating busybody with a keen, Moliere-like instinct for the middle ground in any row, and Hamish Michael is Orton, the would-be songwriter to whose art Alceste applies a verbal sanding machine (justly branding his internal rhymes as crimes). Simon Burke is the self-righteous moralist, Arsenio, Anthony Taufa the self-impressed Angus and Catherine Davies Cymbeline’s devoted sister Eleanor. Max Lambert and Roger Lock’s music plays a diverting role – as does a unicorn, with designer Dan Potra locating the play in a champagne-guzzling world of video-clip production. Overall Fleming makes the satire of hypocrites, liars, role-players and, yes, critics, more savage than Moliere’s. Yet were this Alceste successful in snaring Cymbeline she would not be so very far removed from a Jane Austen heroine.